Finished at last! I started this painting as a demonstration with a painting class that combined art instruction and a Bible study about creativity. I finished it today in my studio. You may think that art and Bible study is an interesting combination, but I cannot paint without constantly being reminded of our Great Creator God. I think about how He invented color and detail, and how there is order and meaning to the universe. I marvel at a flower’s structure and love how light can illuminate, glow, light up a scene or bounce off shiny objects to produce all kinds of highlights. When I observe how things in the natural world fit together, or the beauty in someone’s face or the depth of thought in an individual’s eyes I am reminded that God is the author of everything good and wonderful. There are plenty of things in the world that are difficult, and there are times and places to address these realities. 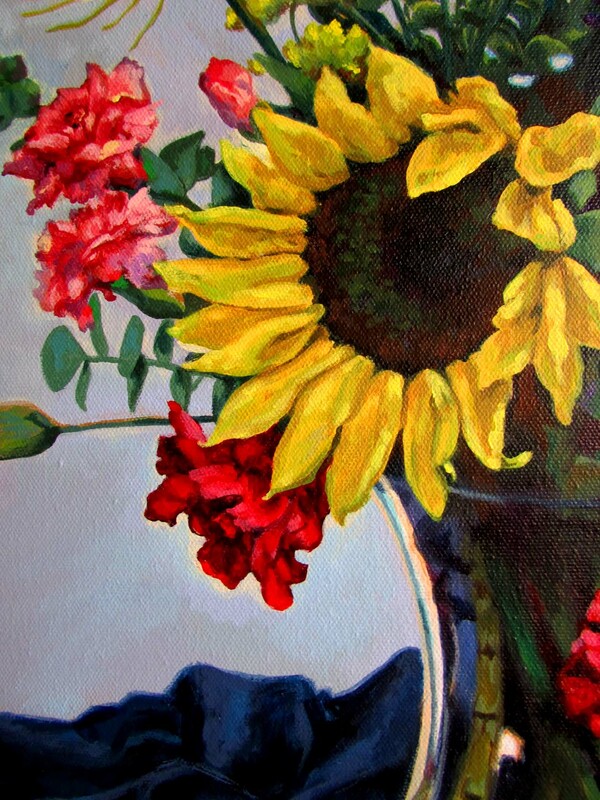 But when I paint, I choose to use my brushes to produce subjects like portraits, landscapes and still lifes. These themes speak to me of the wonder of creation and reflect a fraction of the glory of the Great Creator.